Castlewood State Park is located along the Meramec River in the southwest portion of St. Louis County between the Manchester and I-44 alignments of Route 66. 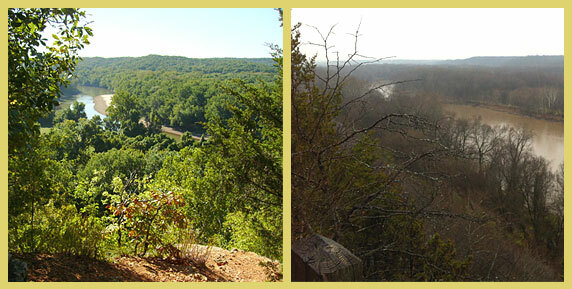 Parts of the park lay on either side of the Meramec River. The part that lies north of the Meramec River is accessible by car south of the Manchester alignment of Route 66 and includes one of the most scenic views in all of St. Louis County. The photos above were taken from the River Scene Trail. In the days before air conditioning, one way people used to cope with the heat was by visiting swimming beaches at the numerous rivers in the region. Caves were popular too. Route 66 fans will recognize the names of the fun places “Times Beach”, “Sylvan Beach”, Meramec Caverns”, “Stonydell” and Joplin’s “Lakeside Park”. Fort Bellefontaine County Park was formerly such a destination – the area that is now Castlewood State Park was another. According to the book “Walks & Rambles in and around St. Louis” by Robert Rubright, the heyday of Castlewood as a resort was from 1915-1950. The swimming beach was washed away by the river in 1945. Some other amenities such as clubhouses, nightclubs and taverns persisted a bit longer. The state of Missouri converted the land to a park in 1979. Signs at the park indicate that while swimming in the Meramec River is not forbidden, it’s not encouraged either and is something to undertake at one’s own risk. Drownings do occur here so be careful. The River Scene trail is so nice that I have explored very few other areas of the park despite many visits. I need to correct that oversight! There is a steep climb to the top of the bluff but after that the trail is not too difficult because it is mostly flat or downhill. You will have to watch your footing because the trail is rocky in spots and it’s possible to trip on tree roots. Sturdy hiking boots and a walking stick are helpful for safety and comfort. There are multiple scenic overlooks, historic ruins from the resort days and a well-traveled railroad corridor to see along the way. Rail fans will normally get a chance to see a train or two while hiking here and a portion of the trail even goes under the railroad bed in a cool tunnel. 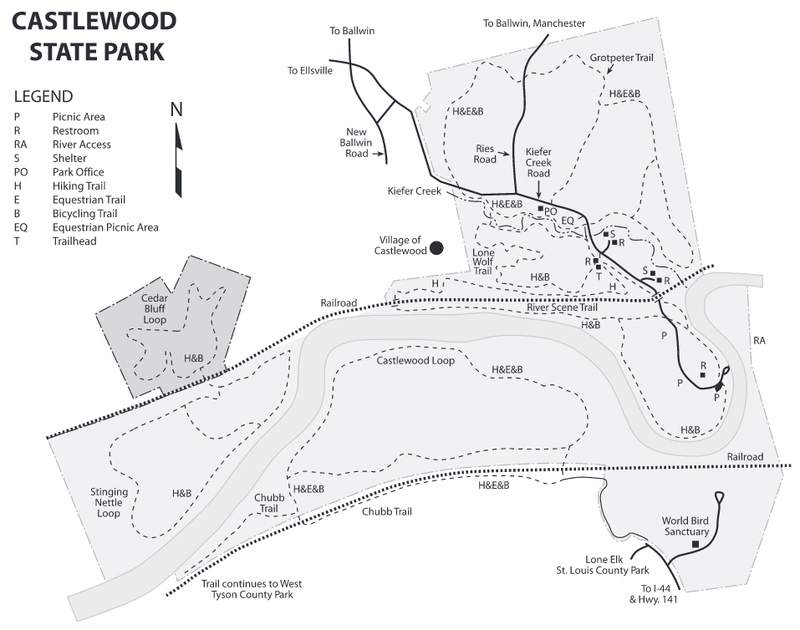 As you can see from this map, the portion of the park that is South of the Meramec River is accessible only by hiking, biking or by horseback. You can take a trail to Castlewood from either West Tyson County Park or Lone Elk County Park. It’s not shown on this map how it connects but if you take the Stinging Nettle Loop at the base of the bluff, you can follow that trail westward to a portion of the Meramec Greenway, Sherman Beach County Park and the Al Foster Trail which begins in Glencoe. You can also take a side trip on the Rock Hollow Trail, also known as the “Zombie Road”. The Stinging Nettle Loop is great for mountain bikers like me who are pretty much at the beginner level. There are some hills but they are not too high and if you fall you’ll probably land on dirt most of the time. I took a minor fall and didn’t get hurt. More challenging trails that I have not worked up to trying on a bike yet are in the area if you’re up for it. If you are getting the impression that you can spend days or weeks here exploring all the trails that connect near here you are probably right! Bring maps because it can get confusing!